UPDATE: 14 JUN 2017 – In step 5 below, please do select 5 minutes timeout for the script. We did have a few issues for users who had a lot of instances taking over the standard 2 minutes for the script to run. 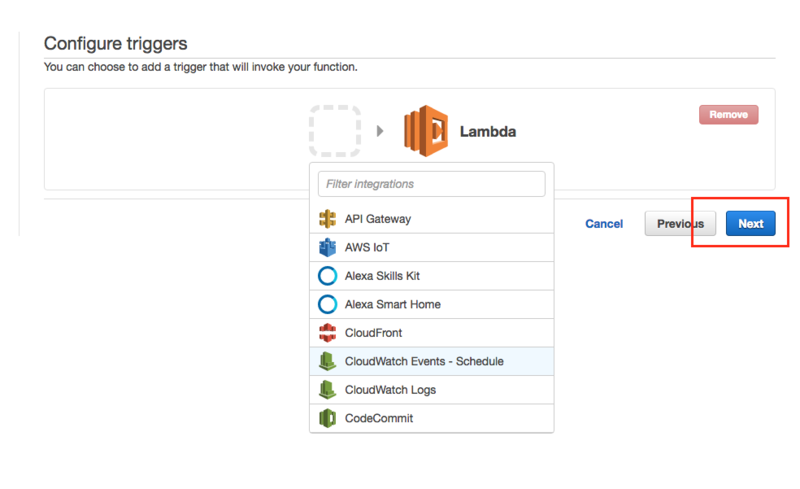 Just a quick blog post to link our new Github script on automated AWS AMI management system. Creating an AMI automatically snapshots all the associated EBS volumes for that instance. This makes instance recovery much more reliable and faster. A daily or weekly backup schedule is recommended for instances and to make sure you have a backup if ever needed. The system also removes the automatically created AMIs and any associated snapshots as per the settings. 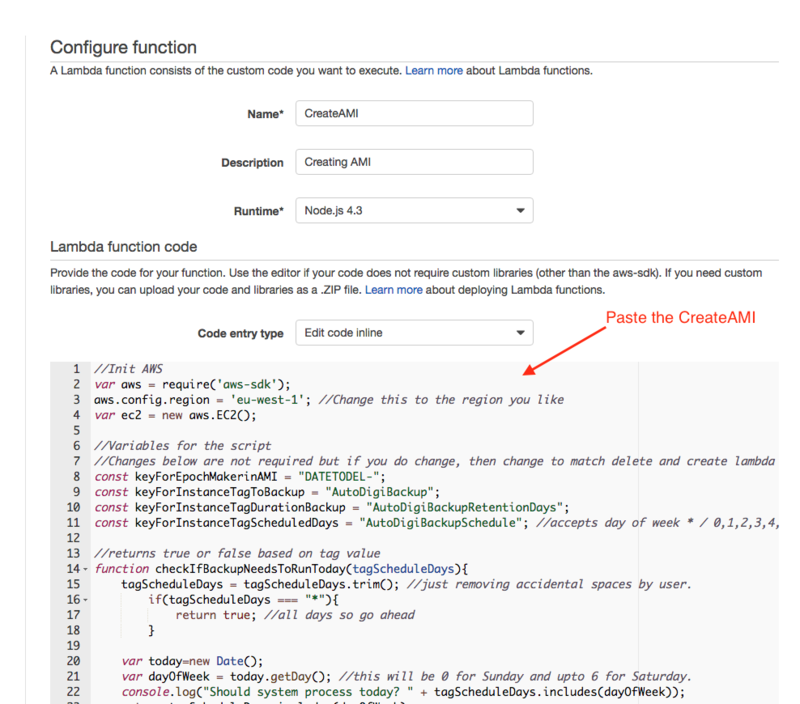 5) Create a new role and paste the roles/roles.json (See github link above) also increase timeout. 6) Save this and follow step above again now using deleteAMI.js (See github link above). 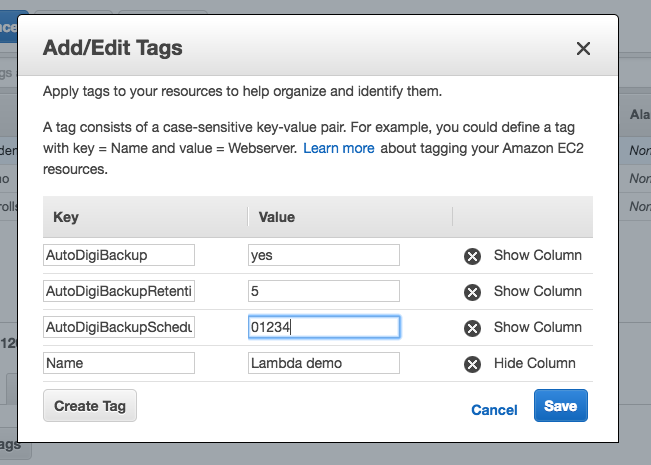 3) Set the three tags with the following Keys & Value a) Key: AutoDigiBackup with Value: yes. This marks the instances that need to be backed up. b) Key: AutoDigiBackupRetentionDays with Value: from 1 to as many days as you want the backup to be stored. c) Key: AutoDigiBackupSchedule with Value: * (for every day) or a mix of number from 0 (Saturday), 1 (Monday) and all the way to 6 (Sunday). You can set value to say 012 which means run on Saturday, Monday and Tuesday. You can set just 6 to run only on Sunday. Save the settings that are approriate for this instance and then save the tags. Please repeat steps 1-3 for all instances that you like to be included. UPDATE: 1st May 2018, new L2TP system is used which is more reliable. YAML configuration is used going forward instead of JSON. You can read more about it on our webdigi github page. NOTICE: 2nd June 2017, we had comments from a few users that some new AWS accounts take a few hours before the account can be activated to use this service. UPDATE: 19 September 2016, Added the new AWS Mumbai region also. So, we all know the benefits of using a VPN like privacy, anonymity, unblocking websites, security, overcoming geographical restrictions and so on. However, it has always been hard to trust a VPN provider who could potentially log and intercept your internet traffic! Launching a private VPN server will give us the best of what a VPN truly offers. This guide will walk you through all the steps to running your own VPN server in about 10 minutes. Simple: Non-techies should also be able to follow this guide easily. Quick: 10 minutes is all it takes to follow this guide and create a private VPN server. Private: Dedicated VPN server for your use only. Secure: Encrypted & password enabled VPN server with no logs. On demand: You can start / stop the VPN server as required. Global: One or more VPN servers in 14 worldwide regions (including London, US, Tokyo, Singapore, Seoul, Canada). Device support: Supports PPTP and L2TP with IPSEC which means you can use the VPN server on your Android, iPhone, iPad, PC, MAC, and even most routers (to support Apple TV, Chromecast). 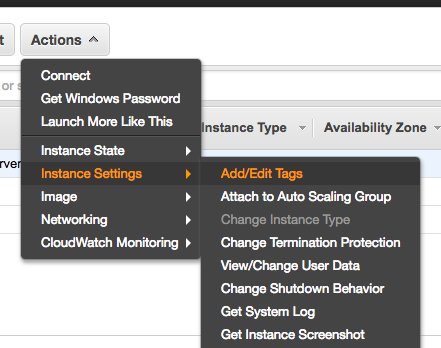 Free: New Amazon AWS customers have a free tier server for the first year. 1. Setup a free Amazon (AWS) cloud account. Visit http://aws.amazon.com/free/ and complete the signup. If you already have an Amazon AWS account then please login and follow on. 2. Select a region for your VPN server. The VPN server can be in the following locations – North Virginia, Oregon, California, Ireland, Frankfurt, Singapore, Tokyo, Sydney, São Paulo. All your traffic will flow through the region that your VPN server is hosted. The selected region will appear in bold next to your name on the top header bar. 3. 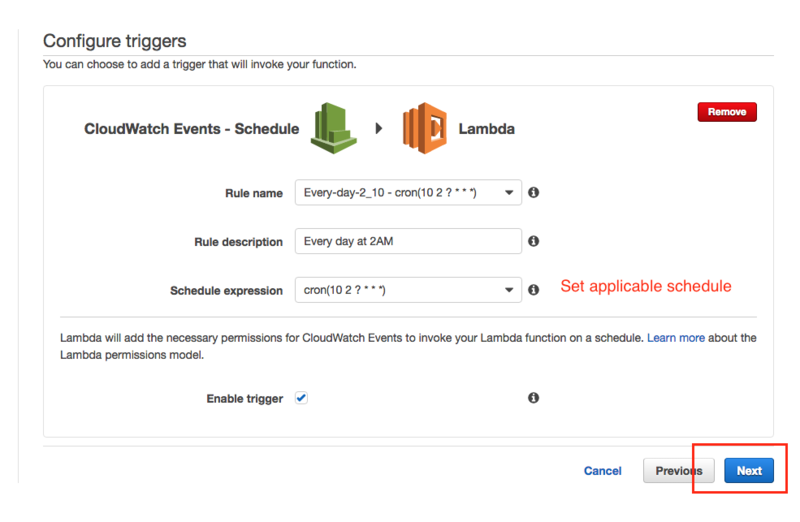 Open CloudFormation in the Amazon AWS control panel. You can follow this link or click on the cloud formation link from the AWS page. 4. Start creating a stack with CloudFormation. Click on “Create Stack” button on top of the page. Enter a stack Name say MyVPN (you use what you like). 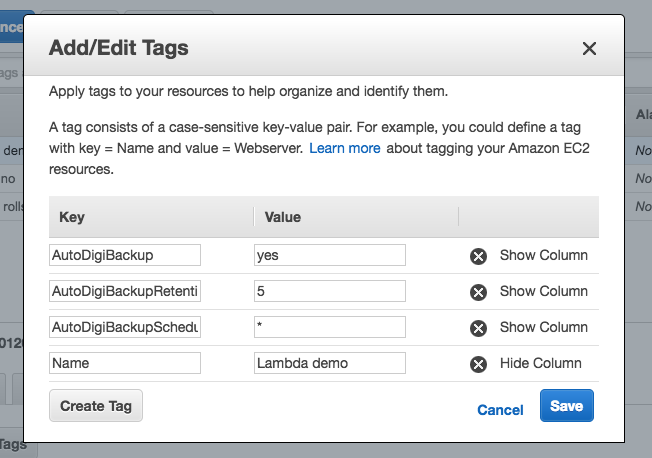 Then under Template, Source, select “Specify an Amazon S3 template URL” and paste in this URL https://s3.amazonaws.com/webdigi/VPN/Unified-Cloud-Formation.yaml and then click Next. Speed: Select Standard.VPN-Free and this should do for most use cases. We have also added faster server options if you ever require VPN with multiple simultaneous video streams and so on. Username: VPN username for your VPN server. VPNPassword: VPN password for your VPN server. VPNPhrase: VPN passphrase the L2TP – IPSEC connections on your VPN server. 7. You will then be taken to the Options section and you can click Next without having to fill anything on this page. Finally, you will see a review page as in the screenshot below. Just click on Create and the VPN server will be created in a few minutes. You will see a page which shows that the status is Create in progress as below. Within about 2 minutes you should see that the stack create in progress is complete as below. Once the stack status shows as CREATE_COMPLETE you can then click on the Outputs tab. Now in the outputs tab you can see the server IP address as highlighted below. Awesome, you should now have your private VPN server running in the IP address shown in the outputs tab. Please note that the IP address is unique for your server and you need it to connect your devices. Now your VPN server is ready and let us connect to it. Each device has its own configuration to connect to a VPN server. We have added a how to for a few popular devices below. Please note that your private VPN server supports both PPTP and L2TP with IPSEC. This means that your VPN server supports most devices out there including older routers. You can connect to your VPN server with either PPTP or L2TP as supported by your device. Server Address: The IP address from step 9 and this is unique for your VPN server. VPN Username & Password: From step 6 above. Same username & password for PPTP / L2TP VPN. VPN Passphrase: You set this up on step 6 above and only have to be used with an L2TP connection. Examples below use PPTP but you can also find out how to setup L2TP with IPSEC on various websites. 2. Setting up VPN on a MAC with the PPTP connection. UPDATE Nov 2016: PPTP is not supported on macOS Sierra so follow point 3 using L2TP over IPSEC (below). First open System Preferences, then Network and follow the screenshots below. UPDATE Nov 2016: L2TP is recommended now. Follow instructions as in PPTP after you setup up to point 8 below. Follow other steps as outlined in the above section on PPTP to finish the setup. 5. For all other devices please search for Setting up PPTP VPN on my iphone and so on. You can also setup an L2TP IPSEC VPN which is more secure but might not be supported on all devices. 1. 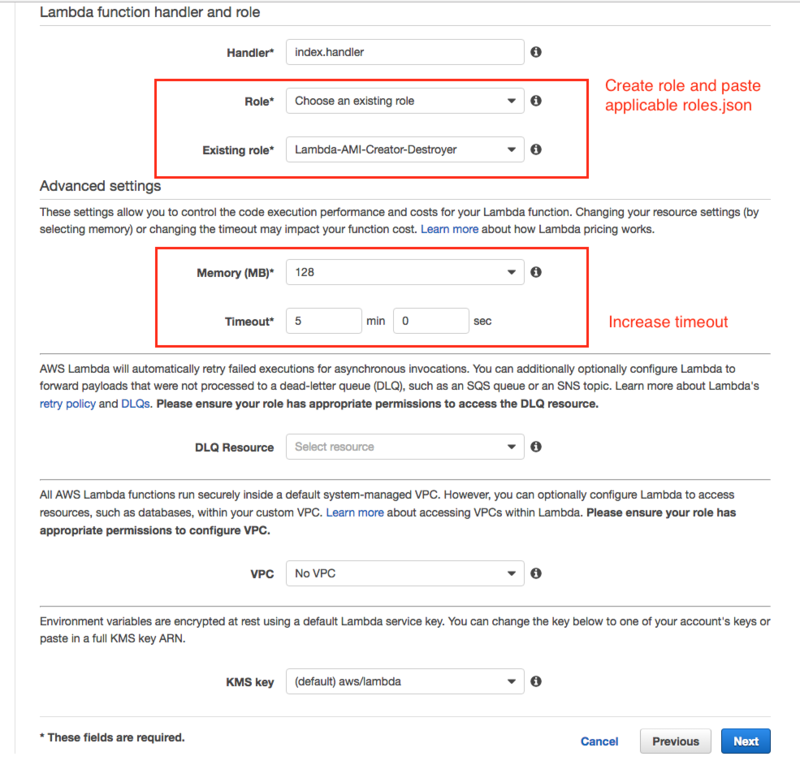 If you want to delete your VPN server then just open CloudFormation on AWS. Make sure you select the same region that you created your VPN server. Then just click on Delete Stack button and your private VPN server will be removed. 2. You can have multiple VPN servers all over the world. You just have to repeat the setup steps in this guide by selecting different regions. Please note that AWS free tier gives you a total of 750 hours a month free. You can also delete and create VPN servers as frequently as you want. 3. Setting up a VPN connection on your router will allow all devices on its network to use the VPN server. This could be beneficial for use with AppleTV / Chromecast and any device that does not support a VPN. 4. You can test if your VPN connection is active by just searching for “what is my ip address” on your favourite search engine. The IP address reported will be that of your private VPN server if everything is your connection is enabled. If your VPN connection is not enabled or if the VPN server settings are not complete then it will report your ISP’s IP address. 5. We love your feedback and let us know if you face any issues in the comments section below or on our github page for setting up your private VPN on AWS. OpenSSL which is used by several million websites was found vulnerable to the heartbleed vulnerability. Thankfully it is quick and easy to fix following these instructions. How can I test the vulnerability? We used a python script to test the vulnerability on our servers. A single python file which sends the target server a carefully crafted heartbeat message and waits for the server to send back a lot of sensitive information. Alternatively you can use the SSL test tool on the ssllabs website. There are hundreds of domain name registrars you can choose to register your website domain name with. EG: Gandi, Namecheap, Godaddy to name a few popular ones. However, we recently had a couple of clients who use markmonitor as their domain name registrar. Looking around on markmonitor website and searching through the whois records revealed something rather surprising. All of Google, Gmail, Youtube, Blogger, Yahoo, Flickr, Microsoft, MSN, Bing, Baidu, Ebay and even Facebook use markmonitor as their domain registrar. Further whois queries shows that 9 out of the top 10 websites by traffic use markmonitor as their domain registrar. This was also the same case with websites of HSBC, Bank of America, UBS and pharmaceuticals like Pfizer, Novartis, Merck and so on. The list of popular domains registered by markmonitor goes on and on. To be clear, markmonitor do not have traffic flowing through them as all companies listed above run their own authoritative DNS servers. EG with Whois of Google.com the name servers are ns3.google.com, ns2.google.com, ns1.google.com, ns4.google.com and all these servers are controlled by Google. In theory markmonitor could change nameserver records to another server and take over any of these websites. Potentially a rogue markmonitor employee or hackers could also change the nameserver records of these top websites on the internet. However, I would assume that most of these nameserver queries are cached by different ISPs for a long time and someone could jump in and fix the issue before it affects a lot of users. In summary, it is surprising that Facebook, Google, Microsoft, Yahoo, Ebay all use the same registrar. These sites and many more under markmonitor account for significant traffic on the internet. Potentially creating a single kill switch for bulk of the internets. Does anyone know of a suitable alternative to markmonitor? Is there a solid safeguard against external parties changing these nameserver records? Try the game before you go through the components that make up this demo. The user scans the QR code or visits the unique link created for them from the demo landing page to start the controller. The controller code reads accelerometer values and then passes the movement to the nodejs server. //ax is the movement on the x axis. The controller code detects movement from accelerometer and only pushes data to the nodejs server if there is a change in direction of the device. This reduces the data pushed from the phone to the server when compared to sending all the live accelerometer values to server. Finally, the value 14 in ax is set as a threshold to detect if the user is moving the device to the left or right. Each visitor to the game landing page is assigned an unique random id that links the browser and the iOS safari instance. User loads the URL provided on their iOS device and then safari detects accelerometer motion, which is then pushed by socket.io on client side to the node server. The randomly generated id is used as a room for the user so that push from user device is only sent to a particular browser. The browser game can be played with the keyboard arrows or with iOS device movement. The space invaders game itself behaves like a standard HTML5 game which uses HTML canvas. Thanks to Erop Balyshev for developing the well tested game in a couple of days. The html game code is commented and you should be able to understand the underlying code for the game quite easily. The socket communication and movement based on feedback from the iOS device was later plugged into the game code. Code below shows how data from server is handled on the browser. //Timer is correctly a shot ever 200ms. //Decrease 200 to lower for even faster firing! – We are very impressed with the instant movement detection and control over the game. – You can also run multiple browsers on your desktop with the same id get parameter and have it all controlled with the same iOS controller. – Current space invaders game uses only X axis movement on the iOS device. However, all three dimension values are available on iOS safari ondevicemotion method. It is technically possible to do much more with the iOS device. Probably the ship can fire when user shakes the device? Enjoyed the demo? Looking forward to your feedback and ideas. Short echo tags will always work irrespective of the ini settings. 4) How long did your script take to execute? Well, we’ve been strongly recommended not to use this on production as this is brand new and not intended to replace Apache/nginx ! The above shell command gets the web server running at port 8080 after setting the Document Root as the current working directory. It also serves static assets and supports URL routing. Traits is “compiler assisted copy-paste” literally, it is also known as “Horizontal Reuse” and similar to functionality of “Multiple Inheritance”. This implementation adds 4 new keywords: trait, use, as and insteadof. As and insteadof are used to resolve conflicts when you use multiple traits. To see this functionality in action, go to the maps page. You need to be logged in to Facebook to view the page. Please note that your location is not stored by us and used just to display a map for the demo purposes. The iframe technique also make it much easier to embed youtube videos and other flash/HTML5 multimedia. This gives users access to related videos and more added functionality. This also includes the ability to view the video in full screen. Click on the image above to go to the video demo page. Like how a video is embedded, you can now embed slides, PDF, other documents using Slideshare or related apps. Here is a direct link to the docs demo page. The previous Facebook page design had top level navigation tabs which have now moved to the left side of the page. This does free up some space and lets the developer create their own top level navigation tab. Including multi level level navigation. There are thousands of Facebook pages including top brands like Coca cola which have the text like “Click on like button above”. This will no longer be required. You can now have the like button within the page. An example is what we have on our page here. You can have a special page displayed for Facebook fans. This is possible because Facebook sends a signed request to your server each time your page loads. This request from Facebook has details like user language preferences, age restrictions and also information showing if an user is a page fan, page admin, etc. All the source code for all the above pages is available on this page. – Our page has been updated to the new version. This is a requisite for working on the new iframe enabled facebook pages. – All the code is free to use as usual and is intended to demo the features of iframes on Facebook tabs. – You seem to need to be logged in to Facebook to be able to view the demo pages in action! What features or possibilities excite you the most? Most web applications at some point will have some sort of an export data feature to get data out of the database in some csv or excel format. CSV is probably the simplest to generate on the fly from PHP and other server side scripting languages. However, I had a particular issue where leading zeros were just not displaying when the csv file was opened with Excel. Look at the example csv below where when opened in Excel will not show leading zeros. "Leading Zeros will not be displayed","0003833","0596"
The best solution to work around this is just to add an = in front of the column to avoid Excel from formatting the column when displaying numeric value. So below works fine. "Leading Zeros shown in Excel",="0003833",="0596"
Hope this simple trick helps you avoid Excel eating up leading zeros in csv! Any other CSV related suggestions and comments are welcome.